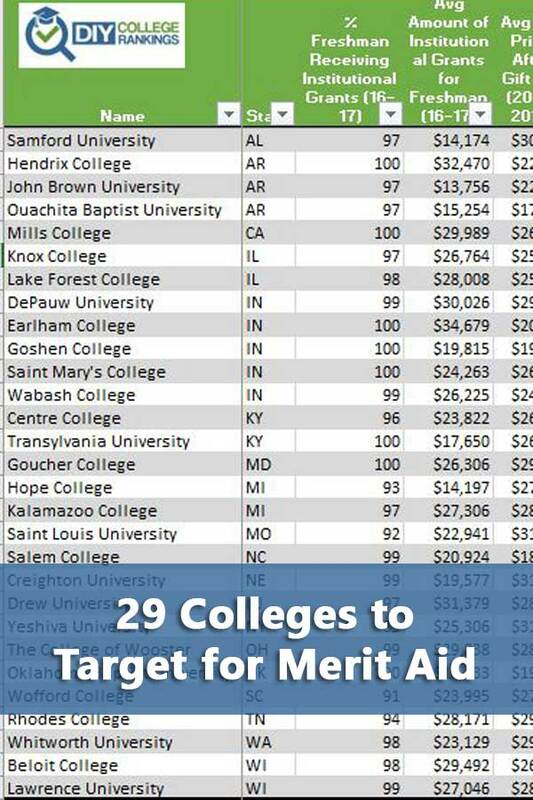 I’ve talked about colleges most likely to provide merit aid before. In this post I’m going to focus just on 50-50 schools and consider all financial indicators. For example, in previous lists I didn’t take into consideration PLUS loans. I also limited schools by test scores which I don’t do in this list. After applying these criteria to 486 50-50 colleges, I was left with 29. According to the Common Data Set, 11 of the 29 meet 85% or less of average need for freshman (not available for 2). Three colleges, Samford, John Brown, and Transylvania only met 80 or less of demonstrated freshman need and these percentages fell for all undergraduates. Chances are these schools aren’t offering great need-based aid. Eleven colleges met 90% or more of freshman need. None had a dramatic drop compared to need met among all undergraduates. Common Data Set information also shows that at 20 of the schools, at least 90% of students without need received merit aid. There were four where the average was less than 80% and the lowest was only 65% which is still very good. However, keep in mind these are self-reported numbers through the Common Data Set and they don’t always add up. Regular readers of this blog will not be surprised to learn that the majority of the colleges are in the south or the mid-west. Only 4 are in the Northeast or the West Coast. All but 9 of the schools are Liberal Arts Colleges. As usual with Liberal Arts Colleges, most are small. Only four had more than 3,000 full-time undergraduates. Fourteen of schools didn’t list any application fees in the IPEDS data. 10 reported fees of $40 or more. Four of the schools require the PROFILE for financial aid and two of those require the non-custodial form as well. Even though I didn’t use any test score requirements, there isn’t a shortage of good test takers attending these schools. Of the schools reporting test scores to IPEDS, the 75th% ACT scores ranged from 27 to 34. Two-thirds of the colleges, 20, had 75th% ACT Composite scores in the 90th percentile or higher and 12 were in the 95th% or higher. Seven of the colleges do not require the SAT or ACT and at another five it was only recommended. The following list displays all schools that met the criteria based on IPEDS data available as of January 2019. All of the IPEDS data is available in the DIY College Rankings Spreadsheet.